Only 750 miles left to go . . . 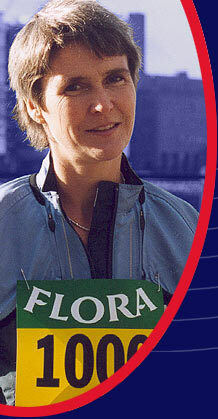 Stamina star Sharon Gayter reaches the quarter way mark in the gruelling Flora 1000 Miles Challenge at 2am tomorrow morning. But the Guisborough ultra-runner is still coping admirably with the awesome test of running 1000 miles over 1000 consecutive hours. Sharon, one of six competitors taking part in the seven-weeks event around London, said today: "It's hard going but I'm still making good progress. "My legs are fine, thanks to regular massages from husband Bill. "And I'm using a foot spa to help prevent blisters." She added: "The only problem so far is that I'm losing my voice! "Twenty four hours a day talking is taking its toll." Among the other competitors, Shona Crombie-Hicks has experienced the most problems so far, with blistered heels. She tried changing back from walking to running but this lasted only for four miles. Now she has resorted to cutting the backs out of her shoes. All six competitors are living on a converted London bus, while walking, rather than running, one mile in every single hour until the 1000 miles target is reached. Those who survive this mammoth test of sleep-deprived endurance must then run the London marathon, with the winner being the one who does best in the marathon. Sharon posts regular updates and receives messages from friends and supporters on her personal website at www.sharongayter.com.